This page is updated and current as of 3/28/2019. Not all dogs that are available at Polaris Alaskan Malamute Rescue are pictured here. Also, some of the dogs listed here may have already been adopted. We try to update our listings weekly. Please call us for the most up to date list of available Malamutes. All of the dogs are up to date on all shots, and neutered or spayed. 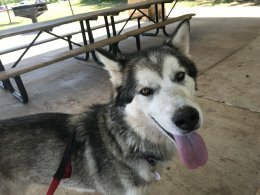 Sometimes we also have Malamute Mix dogs available for adoption. If you might be interested in one of these dogs please visit our Malamute Mix page. Some partners we work with have malamutes for adoption too. Please note that these dogs are not affiliated with POLARIS in any way, but we do want to provide notice that these dogs are available for adoption too. For more information click here. If you are interested in adopting a Polaris dog (either one that is listed here or one that may not be), please fill out our adoption application. Bruno is a wonderful, athletic 1.5-2 yr. old gentle giant neutered male (75 lbs., but has filled out a bit since he came to rescue) who came from a shelter. He is current on shots & medically fit. He was surrendered for escaping, but has stayed within a 6 ft. fenced yard and has done well with puppies through 7 yr. old dogs. At about a year or so he showed no interest in cats & was scared when a cat hissed at him! He seems a bit timid of humans at first, but will roll over & give kisses. He does well on lead and in the house, but does not like a crate & will test it for weak spots to escape. He's used a doggy door before too. - You'll love his howl! Bruno is looking for his forever home. If you are interested in giving him that loving home please fill out our adoption application. Tikkani is a highly energetic 1.5 yr. old female who is well-behaved in the home (when with her humans), very appreciative of human attention (likes tug-of-war) and loves belly rubs! She requires a LOT of exercise and a stimulating environment. She is very bright: learned to open gates and kennel doors! She has not done well in the past with young children (she jumps up on them in excitement and fixates on their movements) or being around some other dogs. She's done well with larger sized dogs, some females - will adjust after a short time if her initial introduction to a new dog results in a slight growl. 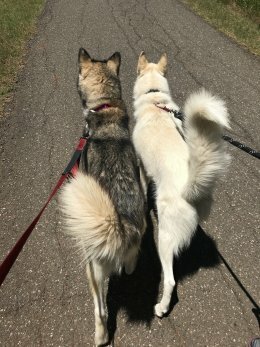 She needs an experienced malamute person who is willing to work on training her on dog socialization, "minding her manners" and calming behaviors. She demonstrates anxiety if riding a long time in the car. She is protective of her food and treats. Tikkani will be a wonderful companion to a highly active adult family who is able to work with her behaviors. No cats, kids under 12 yrs. and needs a breed savvy owner. Tikkani is looking for her forever home. If you are interested in giving her that loving home please fill out our adoption application.